Son’s Addition opened late last year and brought a family-friendly, approachable, upscale restaurant to the 24th Street corridor. Unlike some of the other newbies on the block, Son’s Addition doesn’t feel like a hipster magnet. The space is fresh-looking and cool, with its blue-tiled walls and mosaic wallpaper, along with a couple of whimsical larger-than-life animal prints. The polished wooden table tops and iron chandeliers give the place an air of rustic elegance. Son’s addition is definitely a family affair. Co-owners and husband and wife team Nick Cobarruvias and Anna Sager Cobarruvas hail from Marlow and Maverick, respectively. 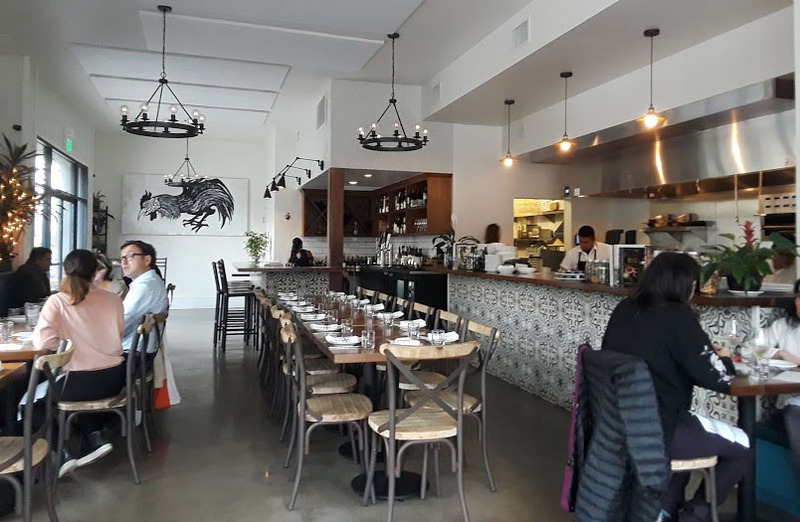 There is an air of Latin going on here for me, as befits the neighborhood, and echoes Chef Cobarruvias’s roots, as his roots are Mexican and French. Because four of us were dining, I only visited Son’s Addition once, because I knew we would order a lot. 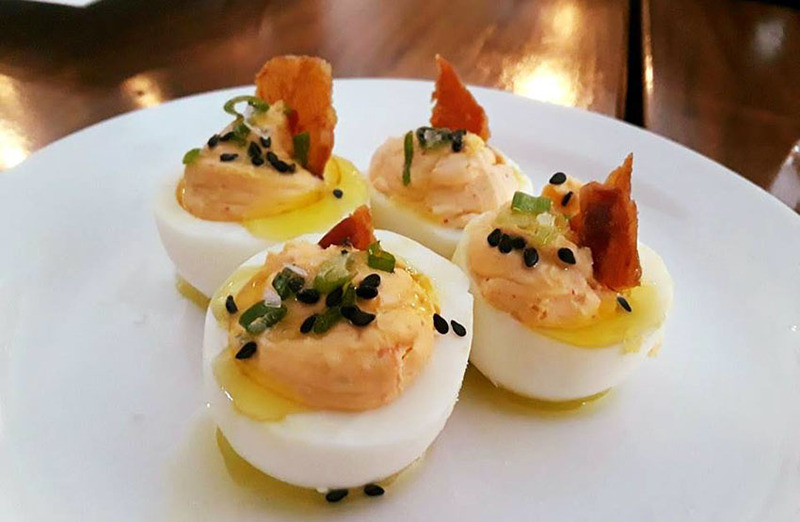 We started with the bacon kimchi deviled eggs. Perfectly delicious, although for me the texture was a bit stiff, not quite as creamy as I expected. But the flavors were spot-on. 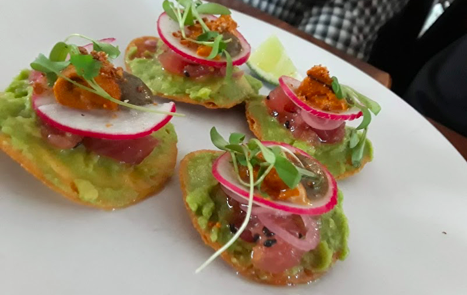 Next, tuna and uni tostadas. Lovely little bites, with charred avocado and heady uni. Cobarruvias’ Mexican roots are shining strong here, while also giving us a hint of his time spent in Asia. The chicken-fried anchovies were addictive. 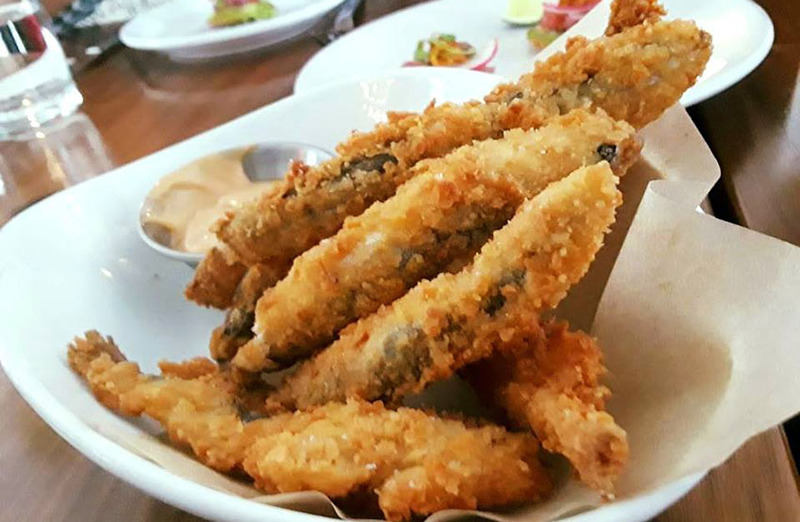 Chicken-fried anchovies with Caesar aioli. 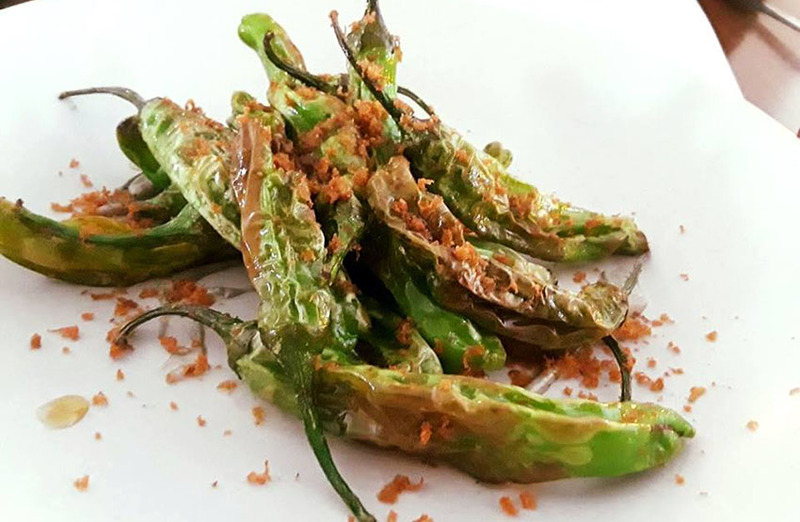 Crispy and salty, paired with a Caesar-dressing aioli, these would be great to munch on at the bar with a cold beer or a glass of bubbly. Not be outdone, the blistered shishitos were served with a huitlacoche aioli. 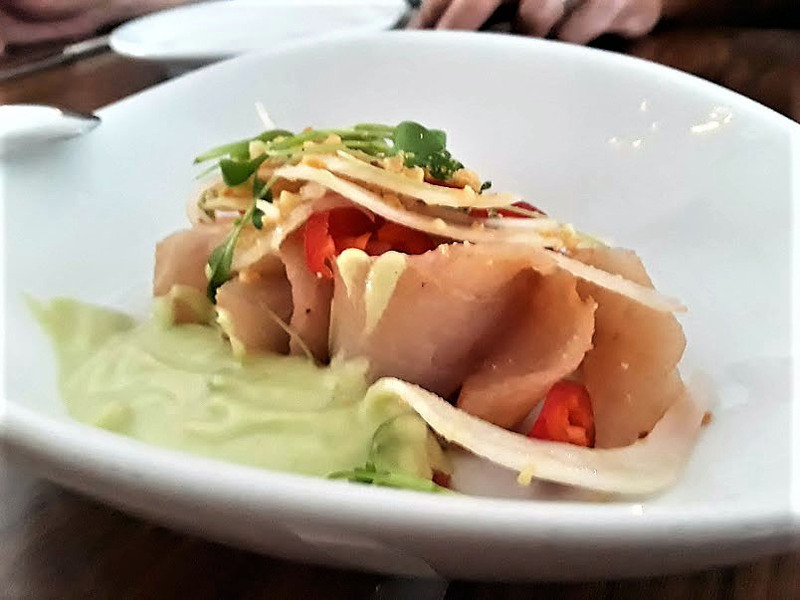 The Hamachi crudo came with a coconut/pineapple water, chilies and peanuts. Achiote-cured, the crudo also came with fermented radish and shaved fennel. But my tablemates could not get past the pineapple/coconut water. Fortunately, I got a bite without it and enjoyed the dish. 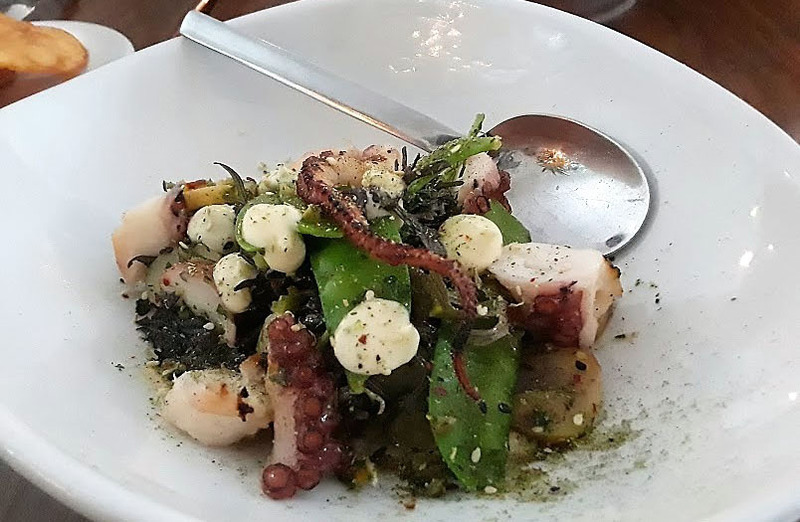 We all loved the charred Spanish octopus. There was nothing extraneous on this plate – from the chickpea puree to the poached potatoes to the snow peas, it all worked. 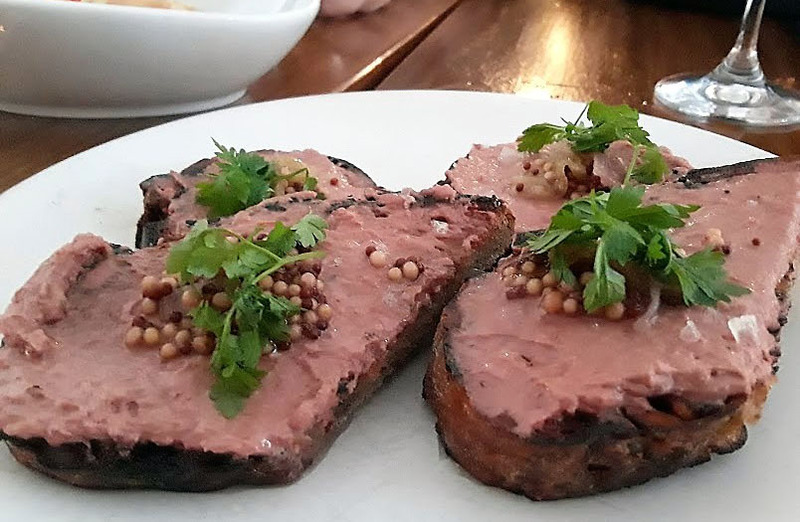 Probably one of those most straightforwardly French dishes of the night was chicken-liver-mousse toasts. Chicken liver mousse with rhubarb mostarda. With the sweet/tart rhubarb mostarda, this was roll-your-eyes-back-in-your-head-good. 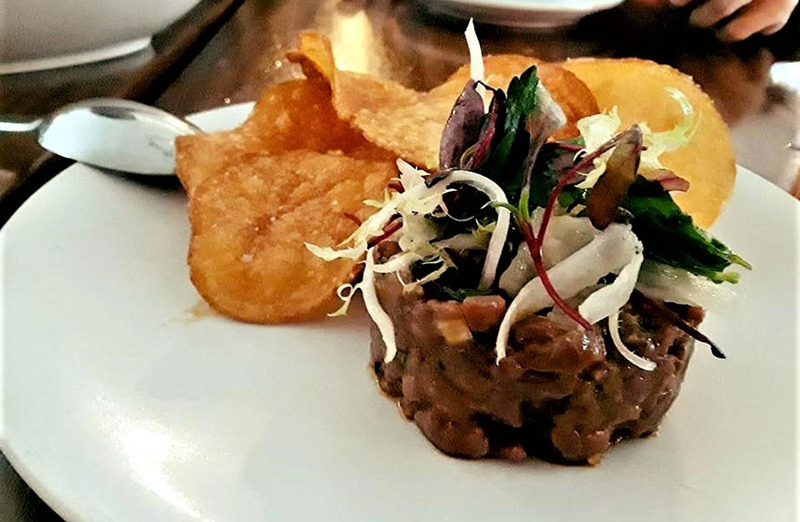 Beef tartare with black garlic and homemade chips. The tartare was flavored with black garlic and lime, and came with homemade chips. Perhaps not my favorite bite of the night, but still interesting and tasty. The four of us, reaching our limits by this time, split two entrees. First, the hangar steak. 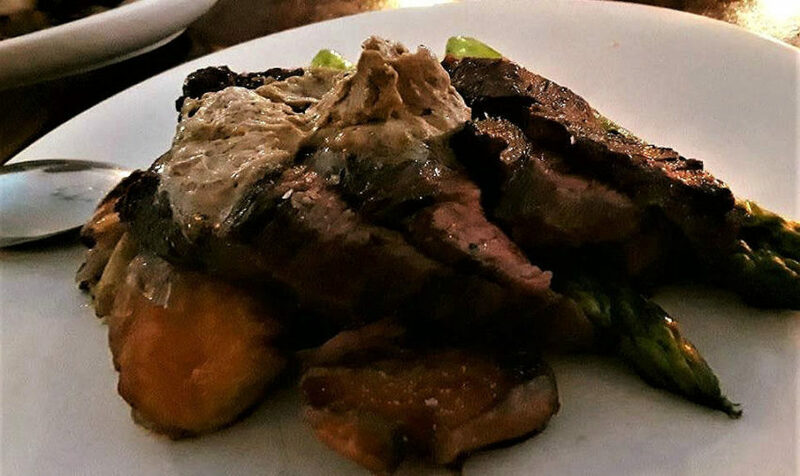 Hanger steak with uni butter. (You’ll have to excuse me — by this time, I was losing the light.) The steak came slathered in a charred onion and uni butter — need I say more? An excellent exercise in decadence. Pork chop with cranberry beans. With meaty cranberry beans and bacon, the chop exceeded expectations, even coming at the end of a very satisfying meal. There appears to be great care in every dish, there were no elements that felt forced. 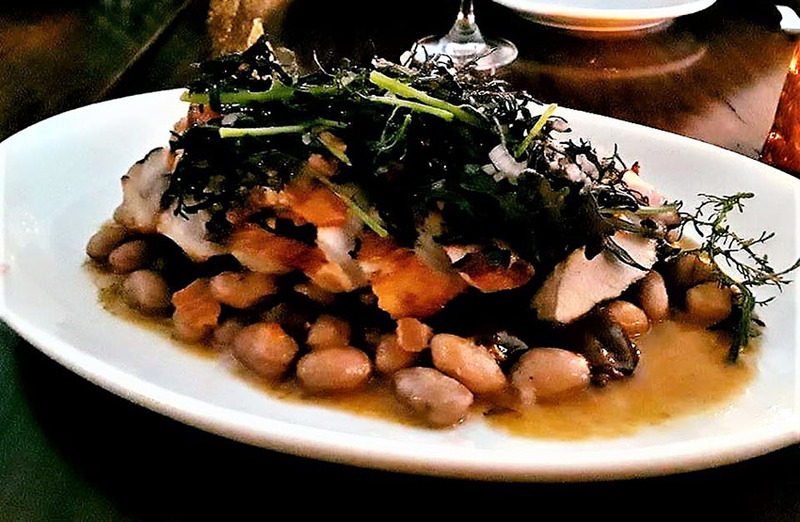 Rather, the combinations felt like natural emanations of Chef Cobarruvias’ life experience. Service was warm and friendly, with just the right amount of presence. The wine list is quite interesting. We had a bottle of lively rosé bubbles from Australia, and from the Big, Bad, Inky and Succulent reds section of the wine list, a boldly delicious blend from Mexico. There are many dishes I’m still curious to try: the roasted marrow bones with tomatillo, the poached chicken with crispy skin — shades of Thailand — the amberjack with sunchokes … and brunch intrigues as well. I’ve heard great things about the fried chicken sandwich. And on my list to try: the low-ABV cocktails, malted waffles and charred avocado toast. I learned that the name “Son’s Addition” has to do with the couple hoping to add an addition to the family — a little brother to their two daughters. 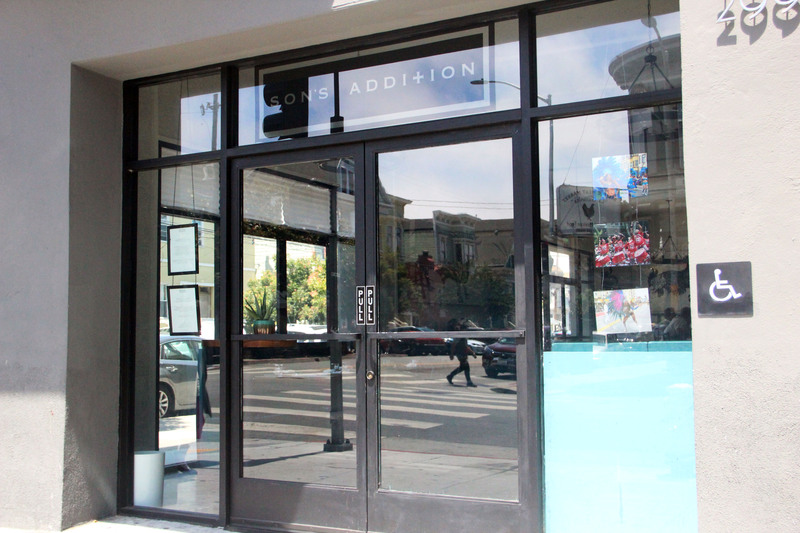 For now, it seems the restaurant is the newest addition to the family, and to the Mission.